If you can’t visit an inn this month, make something in the spirit of love and serve with a Valentine’s Card and a photo of an inn clipped inside along with a getaway promise. Innkeeper Carol Beazley of the Beazley House in Napa, California says her recipe for Sweetheart Chocolate Decadence Cake has been evolving over the almost 30 years she has run the bed and breakfast. Nicknamed “The Ultimate Indulgence” it is often requested for romantic getaway packages or engagements to sweeten the experience. It is a chocoholic’s dream come true – a moist rich cocoa cake covered with a coffee-laced chocolate icing, very reminiscent of Vienna’s famed SacherTorte. Spoil your sweetheart completely by preparing Rivertown Inn’s Molten Chocolate Cake with a silky Truffle Cream. Served in individual ramekins, these sinfully rich warm chocolate cakes become almost indecent with the addition of a truffle cream which combines heavy cream with aromatic cinnamon, white chocolate and orange zest. Melt in your mouth has never been so decadent! All the credit goes to Chef Ray Wyatt who created this dessert delight at the Rivertown Inn in Stillwater Minnesota. Those seeking a classy dish with a fabulous presentation should prepare Flery Manor’s The Perfect Pear Blush in Crème Brule Sauce. 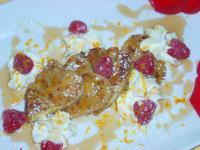 It is an original recipe created by innkeeper Marla at her Grant’s Pass Oregon bed and breakfast. The Anjou pears are baked in a poaching liquid featuring cinnamon and blackberries which make these demur pears blush with a beautiful red color. 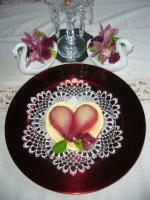 When they cool they are served atop a heart-shaped Crème Brule Sauce. What an elegant indulgence to compliment a romantic rendezvous. For those looking to spice things up for breakfast, try this Grand Marnier French Toast with Strawberries provided by the Groveland Hotel at Yosemite National Park in California. Cinnamon and nutmeg are whisked together with the orange liquor & juice, plus heavy cream to make the spicy coating for the bread, which is pan-fried in butter. Served with luscious fresh strawberries this breakfast treat starts your day with a zing. Should you wish to mix up a love potion the Holden House Bed & Breakfast in Colorado Springs, Colorado has the perfect cocktail. Cleverly called Raspberry Love Potion #2-14, it combines brandy and vodka with cardamom, cinnamon and raspberries for an intoxicating result. Served in crystal glasses it will add a special sparkle to any romantic evening. These are only a few of the many recipes you will find at www.iloveinns.com where innkeepers from bed and breakfasts across the USA and Canada share their favorites at https://iloveinns.com/recipes/. If you don’t wish to do the cooking yourself, then browse through the 19,000 B&Bs and country inns where the innkeepers will pamper you and yours with their culinary skills. Most of the properties listed above are also in the best-selling bed and breakfast guidebook Bed & Breakfasts and Country Inns with a Buy-One-Night-Get-One-Night-Free Certificate. ILoveInns also offers Bed and Breakfast Gift Certificates, a perfect solution to help celebrate any occasion.